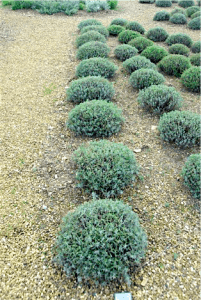 Lavender plants and rosemary plants require well-drained neutral to alkaline soil, although Lavandula stoechas subsp. stoechas (which always grows in acid soil in the wild) and to a lesser extent Lavandula x intermedia, can thrive in slightly acid soil. If your soil is naturally good for growing rhododendrons and heathers add lime to raise the pH. About a handful per square metre in early spring should be sufficient. In heavy soil mix in grit when planting to improve drainage and plant on a slight mound. Wet soil in winter can have a terrible effect on half-hardy and frost hardy lavenders and it is wet soil, rather than frost that is more likely to kill these plants. Plant lavender and rosemary in a sunny position or at least where they are in the sun for most of the day. Don‘t grow them under a leaf canopy. Many can be grown in pots (see below). For informal plantings we recommend 45cm-90cm (18in-36in) between plants, depending on their eventual size. Planting in groups of three is very effective. For hedging, lavenders to 60cm (24in) and rosemaries may be planted 40-45cm (15-18in) apart. 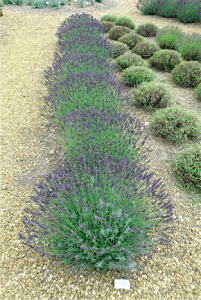 For a formal lavender hedge use one type – the effect is stunning! Any of the angustifolia and x intermedia lavenders make a fine hedge as do all upright rosemaries. Ensure the soil and site are as described above. Moisten the plant compost, but do not waterlog. Dig a hole and add a dusting of bonemeal to the hole, and the soil removed from it, and mix in. Fill the hole with water and allow to drain away. Place the plant in the hole and fill to the level of the compost around the plant and firm in. In dry conditions water the soil around the plant, but do not over water. It‘s easier to add water than to dry out the soil! Be attentive in the first few weeks after planting, especially if the weather is dry. Tender and half-hardy lavenders and dwarf lavender and rosemary are ideal for 30-40cm (12-15in) terracotta pots and look particularly impressive on the patio. Use a mix of one third each of soilless compost, John Innes No.2 or 3 and coarse grit. For feeding, pop in a plug or two of slow release fertilizer, which should last all season. Short plants are great for growing in pots, but watch out for the fibrous roots of all lavender stoechas species and cultivars and the vigorous root systems of all rosemaries. Both will need potting-on regulary. Little feeding is required, although a sprinkling of potash around the base of plants will encourage more prolific flowering and improved flower colour. Don‘t add bulky manure or high nitrogen feed as your lavenders in particular, will grow very sappy and flop open. 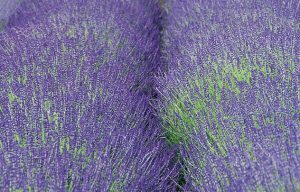 Most lavender for culinary use is harvested when in full coloured bud before the individual flowers open. They can be added to ingredients while fresh or can be dried first. To use lavender for drying and pot-pourri, harvest just before full-bloom and hang upside down in bunches in a dry dark room. Tender and half-hardy lavenders and frost hardy lavenders grown in pots should be given protection in light, airy conditions. These plants need very little water from November to February. Wait until the pot is noticeably lighter or even until plants start to wilt and then water only on top of the compost. Never water over the foliage in winter. These plants find still, moist air rather unpleasant! We field more enquiries on how to prune lavenders than on anything else, so some detail is required. It‘s very important task that demands a strong constitution, because generally the harder the lavenders are pruned, the longer they will last. They require different treatment according to hardiness (see below). These normally flower just once, but may have a weak second flush after pruning. To keep them really under control don‘t be frightened to chop them back to just 22cm (9in) or about a third into the foliage immediately after flowering… they love it! It‘s particularly important to be severe with the x intermedia lavenders, even if you have to sacrifice some late flowers. If there‘s a good smattering of small shoots visible below where you cut they‘ll grow strongly even from old wood, but beware, no shoots means no plant next year as your lavender will die. The exception is Dutch lavender, such as Dutch Group, Fragrant Memories and Lullingstone Castle. These flower well into autumn so just remove the flower stems then and prune into the foliage when the sap’s up, usually in March. If pruned at the correct time, new growth should leave lavenders overwintering as lovely leafy hummocks. Expect hardy lavenders to last up to 20 years, half that on a heavy clay soil. 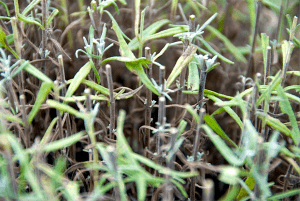 You can even try to save that old gnarledlavender that has an arm‘s length of bare wood topped with a mass of growth. Prune to within a hand‘s width of the bare wood to see if this encourages sprouting further down the plant. If it does sprout, then when you next prune do the same again, until you can‘t see the ground beneath the plant. Of course if it doesn‘t sprout after the first prune put it on the bonfire and enjoy it‘s last lingering smoky perfume… and then buy some more!! Typically these have ‘ears’ and because they flower from spring to autumn it‘s difficult to know when to take the plunge. 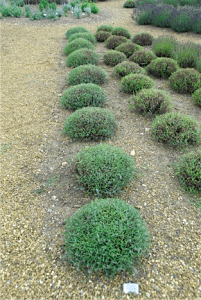 A general guide is to prune hard to 22cm (9in) immediately after the first flowering – observing the small shoots rule above under Hardy Lavenders. Dead-head for the rest of the flowering period, with possibly just a light trim to polish off the season, but no later than mid-September. Expect these lavenders to last 5-10 years. These are the toothed and three-headed exotics that flower almost continuously, so there never seems to be an opportunity to get out the secateurs! Generally, dead-head throughout the year with the occasional severe prune, as outlined above, to keep the more vigorous forms in shape. After a severe pruning keep the compost on the dry side until you can see a moderate flush of new growth. Expect these lavenders to last five years… so try some cuttings or save seed. We don’t have the space here to give complete recipes, but have provided a few hints and tips! The main lavender ingredient in recipes are the calyces (‘flower pockets’ as we call them) or grains of angustifolia and used more sparingly, x intermedia. Use about twice as much fresh lavender as dried. Harvest lavender when the heads are in full colour, but before the flowers come out. Use the grains whole or chopped or bruised to release the flavour. Store in a sealed container for later use if required. Start by using a little and increase quantities according to taste. Adding too much can give a bitter taste, although the flavour mellows once cooked. One of the easiest ways to transform food, giving it a beautifully floral flavour, is to use lavender sugar in place of plain sugar. Mix it about a month in advance to enable the flavour to infuse. To use directly in scones, biscuits and shortbread mix up to a tablespoon of grains per dozen. We can particularly recommend lavender honey either as it comes or with lavender grains added. Try mixing lavender with other herbs in a vegetarian pizza or goats cheese tartlets to produce a floral herbal flavour. Chicken, lamb and salmon are also suitable savoury dishes where lavender can be used effectively either as whole flower spikes, grains or as a rub in oil or with other herbs. Add about 1 teaspoon of fresh lavender to boiled or sautéed potatoes. Use lavender stems as skewers to flavour barbecued food. The latest book we thoroughly recommend for inspirational mouthwatering lavender recipes is Sharon Shipley‘s ‘The Lavender Cookbook’. Lavender can be used in place of rosemary where that herb is commonly used. Just double the amount used.